20. Lustra. London: Mathews, 1916. 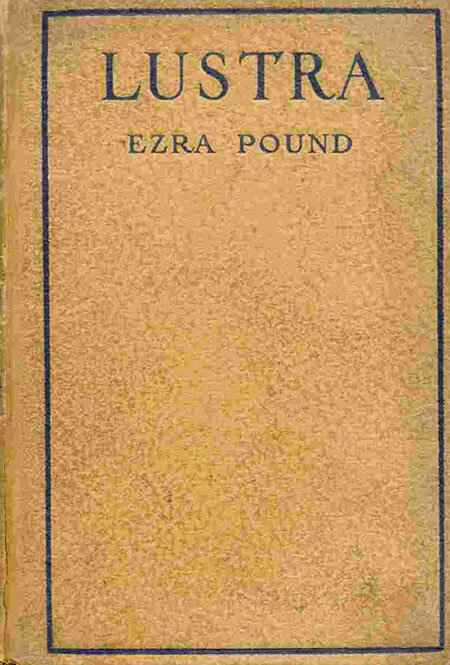 Enlarged ed., New York: Knopf, 1917. Reprints In a Station of the Metro (3); April and Gentildonna (5); Liu Ch’e (7a); Fan-Piece, for Her Imperial Lord (7b); Ts’ai Chih (7c); and, as ALBA and THE BATHTUB, sections II and VII from Zenia (6); in addition Miner (A25, pp. 112-23) mentions other work collected here in connection with Pound’s use of the hokku-derived ‘form of super-position’ (see 3 and 12), including Women Before a Shop; L’Art, 1910; A Song of the Degrees; Coitus; Shop Girl; Fish and Shadow; closing lines of Near Perigord; and The Encounter, which closes with an image of a woman’s fingers that are ‘like the tissue / Of a Japanese paper napkin’; most of these works had appeared in periodical publication from 1913 to 1915 (see Gallup ). The American edition adds Impressions of François-Marie Arouet (De Voltaire) (25) and revised versions of ‘Three Cantos’ (27). All work from the first edition is reprinted in 37 and 39. See also A40, BK77f, 86.